Administrative Assistant Training Materials are designed for trainers to develop strong administrative assistants in the work place. Teach your employees the importance of appearance, the steps to feeling good, how to deal with tough issues, communication skills and more! Seeing is Believing This sample manual to teach Skills for the Administrative Assistant is in MS Word format. Skills for the Administrative Assistant has collected rich, up-to-date training material that makes training for administrative assistants easy and accessible. Skills for the Administrative Assistant teaches students writing and communication skills, including tips on proofreading and punctuation to ensure their writing has a professional polish; how to get ahead by proactively managing their time and priorities; the importance of professionalism in their appearance and interactions with people; and how to effectively recognize and manage conflict by dealing with problems assertively without being aggressive. Velsoft's Administrative Assistant Training Materials are completely customizable for instructors, so it can better meet the needs of your classroom. A two-day course, instructors receive an instructor's guide, student materials, activities, and more, and can even combine their classroom administration training with eLearning. Ask about our blended-learning solutions to maximize your training budget! Want to see what modules you will cover? 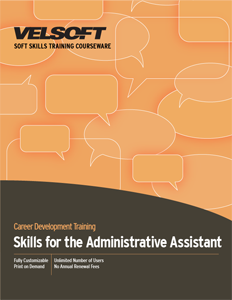 Check out the Skills for the Administrative Assistant Course Outline!